A fragment of a sculptural tableau that represents a character with 2 left arms, which might have been attached 1,100 years ago to the façade of the Niches Pyramid, was discovered by researchers of the National Institute of Anthropology and History (INAH) in El Tajin Archaeological Zone, Veracruz. 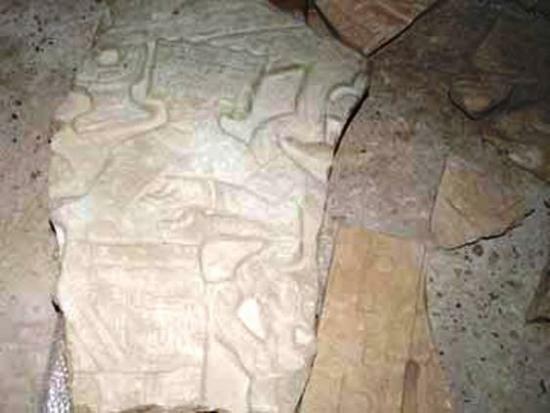 The finding took place in late 2010 in the bed of a stream located 100 meters to the west of the pyramid, when rain left uncovered a fragment of sandstone (86 by 61 centimeters and 15 cm thick) with a bas-relief scene partially eroded. Its similarity with other tableaux, the last of them found in 1980 at Niches Pyramid, point out that the one recently discovered must have been exposed at the structure in late Epi Classic period and early Post Classic, between 900 and 1200 of the Common Era, declared archaeologist David Andrade Olvera, who works at El Tajin. “The bas-relief character is depicted with his face in profile and torso to the front, showing 2 left arms represented one under the other, but we cannot clearly see where the right arm is. “This representation of the human body is associated with the sacred world, and although it presents elements like the google eyes and fangs, the eroded image does not clearly depicts it is Tlaloc”, declared the chief of Legal Protection of the archaeological zone. The fragment of tableau, which currently undergoes deeper investigation, could be exposed temporarily at the El Tajin Site Museum, as the piece of the month in the second semester of 2011, and will probably become part of the permanent collection of the museum. When describing the iconographic elements of the finding, Andrade remarked there are similarities with other tableaux, as well as unique elements, such as the fact that “it carries a rectangular headdress that resembles the one beard by the character of Tableau 28 at Niches Pyramid; nevertheless, the recently found fragment presents ear ornaments that are not depicted in other bas-reliefs at El Tajin”. Besides a necklace of trapezoid beads and bangles, the anthropomorphic character wears a reticulated skirt girded with a double sash at the waist with a knot of fringes that hang at the front; this kind of tie is observed as well around one of the arms. “In the back of the head, described the archaeologist, part of the body of a serpent is observed, with the scales realistically depicted, while frets of Tajin style are found to the left, and circular representations of jade beads are depicted at the bottom”. Another aspect that does not resemble the pattern of Niches Pyramid tableaux is a symbol apparently suspended at the front of the character integrated by a disc with 3 beads inside and a tongue that hangs in the bottom. Andrade explained that after the city was abandoned the tableau might have detached from the pyramid and swept along by water flows; or else, it might have been intentionally detached and reused near the stream, falling into it later. After exploration of the area where the fragment was found, to know the characteristics of the context, archaeologists sampled associated material and soil to conduct laboratory analyses. “To present, no other fragments have been found” concluded the expert.